AgeMeter is a successor to the H-SCAN Functional Age Test, which was introduced in 1990. Centers For Age Control, the company behind the AgeMeter, and its founder was a dealer and then a distributor of the H-SCAN from 1999 until 2013 when the H-SCAN was discontinued by the Hoch Company, the developer and manufacturer of the H-SCAN. Centers for Age Control is leveraging today’s most forward-looking technologies to bring the H-SCAN into the forefront of medical tech at a cost-effective price. While the H-SCAN sold for $23,750, the AgeMeter is shipping at just $7,500. The AgeMeter device measures functional biomarkers of participants, estimating the age at which a person physically functions, enabling researchers to validate measurements from genetic and biochemical aging interventions and reliably compare results across subjects, studies and approaches. Many laboratories have published results indicating the reversal or delay of various biomarkers of aging in model organisms and human cells, including cellular biomarkers such as telomere length, epigenome methylation status, expression of proteins specific to senescent cells and others, as well as morphological and functional tests, such as appearance, gait and balance, memory tests, etc. Thus far, however, there has been no fully integrated approach that can easily collect a variety of different data points from human participants, reliably correlating the output to functional age and comparing this against chronological age. Being able to easily evaluate the effectiveness of a potential aging treatment in this way will allow longevity research to proceed at a faster rate, because meaningful data in regards to lifespan effect can be gathered in the middle of a study, not just at the end. Clinical staff are not required to run the tests. 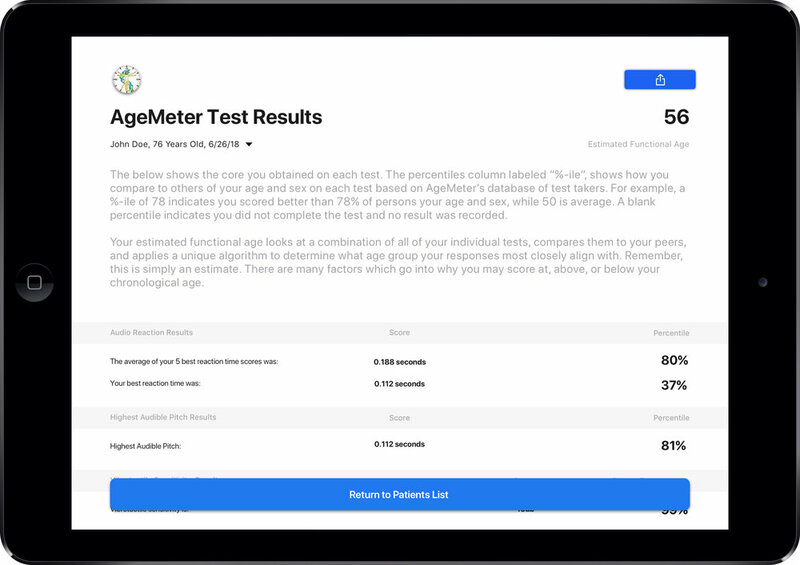 The AgeMeter utilizes Apple’s progressive ecosystem, the iPad, and an intuitive and guided user interface to ensure users of all ages can easily navigate each test confidently. Error-checking features monitor every move and provide video guidance to assure that each procedure is correctly performed. Staff is needed only to enter a few items of information, and collect the results at the end. Testing time is about 35 to 50 minutes. All the response data from AgeMeter is encrypted and stored on a centralized cloud-based database. Doctors and researchers will have access to an exclusive portal enabling them to view patient and participant test results, and compare performance against AgeMeter’s global database of participants. Each device will automatically update to reflect the most recent enhancements to algorithms and population of test respondents. At the end of testing, AgeMeter provides scores and percentiles based on the global AgeMeter database of respondents. Percentiles are displayed, providing a quick overview of strengths and weaknesses. Additionally, a combined functional age is also shown aggregating all results of the user. These reports are made easily accessible to the medical professional or researcher. © 2019 Centers for Age Control Inc.